Intel in December will start shipping a fully loaded drone kit to let you do just that, with all the parts including the rotors, software, 3D camera and flight controller. Intel’s Aero Ready to Fly Drone kit will go on sale on the company’s website. An Intel spokeperson couldn’t immediately provide a price. But it won’t be cheap—likely more than $600. The quadcopter kit has parts that Intel uses to build its own drones. On the company’s part, the drone airshows it has organized are getting ambitious: the company has put up 100, and most recently, 500 drones in the sky. Drones themselves are getting sophisticated. DJI’s Phantom has chips and 3D cameras that can navigate safely while avoiding collisions. The Intel Aero Ready to Fly Drone kit has the 3D RealSense camera, which can measure distances and recognize objects and help the drones, when programmed correctly, to fly autonomously to a given destination. I’ll post some flight video soon. Sky-Drones is introducing SmartAP RTK, this is a perfect addition to the flight controller when positioning precision really matters, it provides centimeter level accuracy. The system is based on the latest UBlox Neo-M8P chipset and is fully integrated across all SmartAP flight controllers and software. Standard telemetry is used to send RTCM corrections via SmartAP GCS. Real Time Kinematic (RTK) satellite navigation is a technique used to enhance the precision of position data derived from satellite-based positioning systems (global navigation satellite systems, GNSS). It uses measurements of the phase of the signal’s carrier wave, rather than the information content of the signal, and relies on a single reference station or interpolated virtual station to provide real-time corrections, providing up to centimetre-level accuracy. Position estimation is at the level of 1-2 cm. Recently, a company called 360.place contacted me about mounting a GoPro VR Rig to an Inspire 1 drone. Getting paid to work with new and interesting technology is pretty much the most fun an engineer can have, so I was thrilled to take on this challenge. After about a month of work designing and building the rig, I had something that the customer was pleased with, however, it definitely took some work to get things right. Here are a few of the lessons I learned on this project, as well as a few that I got right the first time! At the start of this project, 360.place decided themselves what type of drone and camera they wanted to use. The good thing is that two of the project conditions were already taken care of, but on the other hand, I had my doubts about whether this drone could lift what we thought was a 5 pound weight. After the vehicle struggled to lift 4 pounds in a test video (not ours) seen below, a 5 pound weight plus whatever I needed to use to attach it seemed like it would be impossible. The obvious solution to mount this rig was to run some sort of rod down from the center of the DJI Inspire. This has been done before, but I didn’t see a good way to do it without modifying the quadcopter itself. For better or worse, when I can’t figure something out, it just tends to churn over and over in my head until I have a good solution. Perhaps I should figure out how to charge for these random “unguided brainstorming” sessions. On the other hand, listing “$300: staring off into space for several hours” on an invoice likely wouldn’t go over too well. The final idea hit me while driving, “Why not mount it to the carbon fiber rods attached to the motors?” I’m not exactly sure how inspiration struck, but having 30 minutes or so where I was entirely free from distraction besides staring at the road really seemed to do the trick. Perhaps taking a break from everything once in a while is a good idea in the creative process. Just remember to note your great ideas down when they come! One thing that struck me while doing this was how expensive carbon fiber and other lightweight components are. The rods attaching the camera rig carrier to the Inspire cost well over $100, and I purchased several components in aluminum that traditionally would be made out of steel. Add to that some machining time to take off extra material, and the costs really start to add up. After the first failed experiment, we loaded up the quadcopter incrementally. First we just used the rig with no weight, then a lighter Samsung camera, and finally a weight representing the Omni. There was no real problem this time, but perhaps if we’d tried this procedure the first time, we could have avoided a crash. The one upside to this crash was that we did record it from several angles. Besides perhaps being educational for others or even myself pursuing their own filming system, I found it quite entertaining. One thing that may stick out is that while the pilot tried to go catch the Inspire, you can see me leaving. Though it might not look very “heroic,” having worked on and around machinery for many years, I always try to remember that your hands, eyes, or life isn’t worth whatever piece of equipment you’re working on. When things start to crash, in most cases it’s best just to let it happen. During this process, I said that I didn’t want to fly the drone, I’d leave it up to the customer. Probably a good policy, but while I had it to work on, I needed to do some landing gear testing and decided to take it up myself. I had permission, and had been assured that it was OK with the customer, but obviously didn’t want to crash their multi-thousand dollar quadcopter. To my pleasant surprise though, the controls worked in the same manner as the little Hubsan drones that I’d crashed hundreds of times, and I was able to take off and land with no problem. Though it was easy to fly with no payload, after trying it out myself, I requested to fly the entire rig during our final test. This wasn’t a problem initially, but when I decided to pull in for a landing I was a little off, tilting the quadcopter, and eventually causing it to topple and crash. Fortunately, there was no serious damage, but I was quite embarrassed. The gimbal mount was cracked (re-cracked actually, since I repaired it from the first crash), and one of my custom rod ends pulled out of the carbon fiber. Overall it was a successful project, and I hope I can help them with other projects in the future. If you’re interested in building your own rig, I put my design and bill of materials up here (with permission) as well as more information on the design process. I invite you to check it out, and hopefully this post helps you realize what went into building it! DroneDeploy’s new App Market fills a need for commercial drone use, but can the data quality measure up for widespread industrial use? This past week, DroneDeploy introduced its new App Market, a store for drone applications from a range of companies—including Autodesk, Box, John Deere, and 13 others—as well as a variety of industry verticals. Additionally, it includes applications from Airmap, Dronelogbook, Flyte, Kittyhawk, NV Drone, Skyward, and Verifly that help pilots and businesses manage drone operations and compliance. In a nutshell, these apps enable enterprises and drone-based business service providers to automate their workflow and data integration with specialized tools built right within the DroneDeploy user interface. In one way or another, the apps enable businesses to extend the capability of DroneDeploy’s automated mapping and online drone data services with apps that augment flight planning, logging, data analysis, export, and more. Apps appear in different areas of the DroneDeploy interface, depending on what they do, and you install them in your DroneDeploy account. For example, a flight planning app will appear in the flight planning interface, whereas an export or integration app may appear in the export menu. You can read about the details of this announcement here. And all at low power consumption they say! Nice! 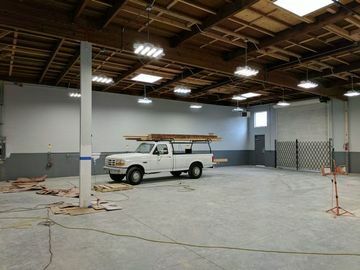 For those in the SF Bay Area and interested in the DIY autonomous car scene (which I’m also part of), here’s the latest on our hackathon this weekend. Carl, Joshua and I are looking forward to seeing you all this Sunday (10:00am – 3:00pm) in Berkeley for the meetup/hackathon. Here’s some information to help you prepare and otherwise make the most of the event. If you want to race, bring a ~1/10 scale car/rover (anything under about two feet long) that is capable of autonomous navigation with computer vision. Already got something like that? Great! If not, if you’ve got a RC car and Raspberry Pi + camera, you can start with the Formula Pi code (forked version here), although please note that that code does assume you’re using the ZeroBorg motor controller board with a Raspberry Pi Zero. If you don’t have that board, you’ll have to modify the code to support whatever motor controller you are using. I’ll have 3-4 Raspberry Pi-based rovers available for people to hack on. They don’t have the ZeroBorg boards, so no guarantees that they’re ready to roll without modifications. But who knows? Perhaps I’ll have them running by then. As an additional navigation aid, we’ll have a ultrawideband indoor positioning system set up. This uses the Pozyx system, so if you’ve got one of those, you should be able to use that. What about larger autonomous cars, from go-karts to full-size? If you’ve got one, bring it for show and tell! We may have access to the parking lot a block away for some slow-speed driving, but no guarantees and definitely no racing. 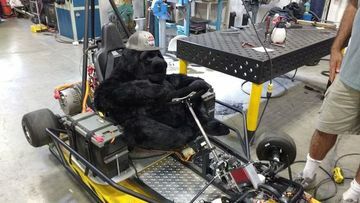 The famous Carl Bass autonomous monkeymobile will be there. Rides may be offered, although you’ll have to fight the monkey for the wheel. Other stuff that will be provided: Tables, chairs, power, wifi, coffee, pizza. And interesting fun. Don’t worry if you don’t have anything to bring/hack on. You’re welcome to just hang out and do the meetup thing. Or help others hack their things. This is that brief moment where we can all be n00bs. Someday our cars are supposed to be perfectly safe and autonomous. But for now, let’s hack and crash while we still can. Looking forward to seeing you all on on Sunday. 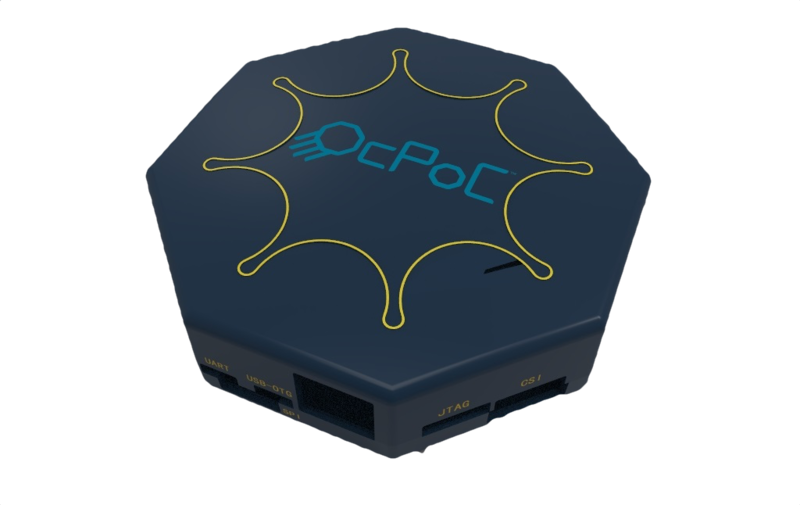 OcPoC (Octagonal Pilot on Chip) is the SoC FPGA-based open-source flight control platform engineered to bring you greatly enhanced I/O capabilities and processing power that is unparalleled by any other platform of its class. Including the traditional sensor options for common peripherals, OcPoC also expands its input and output capabilities to include fully programmable PWM, PPM and GPIO pins to integrate with a vast number of different sensor additions. It also includes many other standardized connectors for peripherals such as GPS, CSI camera link and SD card. Drone developers can integrate various sensors and have the processing power to not only run ArduPilot but also implement real-time processing of sensor data simultaneously. OcPoC opens the door for drone development to the next level. OcPoC-Zynq is powered by the Xilinx Zynq processor which combines the flexibility of FPGA architecture with the processing power of ARM, all in one SoC. Along with the I/O expansion, OcPoC provides increased processing power capable of achieving real-time sensor fusion and onboard data processing. This advanced system caters to both the UAV enthusiast that wants a ready-to-fly package and also to programmers and developers wanting a platform to power their ideas. The Federal Aviation Administration last week granted Disney a waiver so it can show off its amazing drone skills in the Orlando and Anaheim parks. Not a company known to wait well, it’s already released a video teasing Disney’s use of the drones to create what appears to be a floating, rotating Christmas tree. In the application to the FAA from October 2015, Disney stated that the drones (which it calls “Flixels”… how adorably Disney is that?) would operate in no-fly zones away from guests in restricted areas. In addition, the filing stated that these Flixels are less than 40 inches in diameter, weigh less than 10 pounds and fly at “six knots groundspeed” or about 7 mph. The drone-love is nothing new for Disney — it filed multiple patent applications in 2014, including one for marionettes supported by drones. And this year, the company was granted a patent for a drone with an attached projector. A huge amount of effort has gone into this exciting new release of ArduPilot: Copter 3.4.1. 3.4.2 RC1/2 work is already well advanced and will be available shortly, but consists only on small minor improvements. For some of us that fly small drones the support for the PixRacer is fantastic, and even the new PixHawk 2.1 from ProfiCNC is already supported. 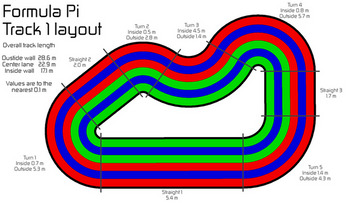 Overall is a great release, with a high degree of professional work by the entire ArduPilot team.